Faith In Seattle Police 'Shaken' By DOJ Investigation A Justice Department investigation found that Seattle police officers use force "in an unconstitutional and excessive manner nearly 20 percent of the time." Now, the city must decide whether to submit to court-supervised reforms or risk being sued by the federal government. Protesters demonstrate at City Hall in Seattle on Feb. 16, 2011, after the announcement that police officer Ian Birk would not face charges for the fatal shooting of John T. Williams. Police departments have come under increased scrutiny from the Obama administration as the Justice Department's Civil Rights Division steps up investigations of corruption, bias and excessive force. Some of the targeted law enforcement agencies have had ethical clouds hanging over them for years — the New Orleans Police Department being the prime example — but others, like the Seattle Police Department, aren't exactly usual suspects. 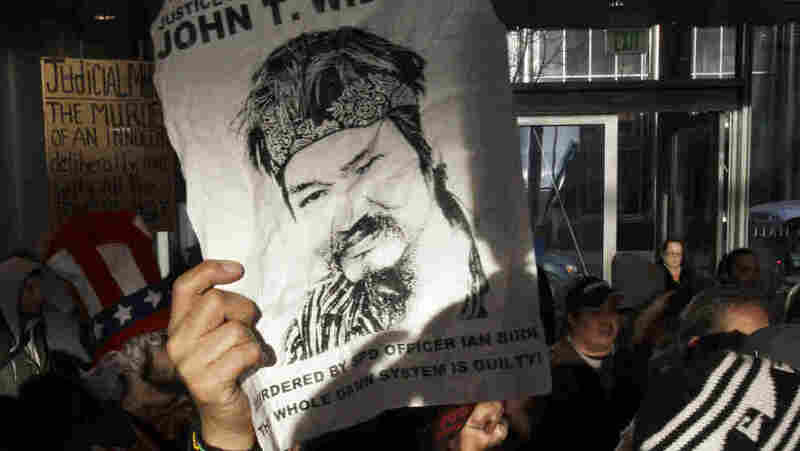 Seattle came to the Justice Department's attention a year and a half ago, after the shooting death of John T. Williams, a homeless man of Native Canadian descent. Chris Stearns, a lawyer on the city's Human Rights Commission, recalls that Williams was killed for walking across a street carrying a carving knife and a piece of wood. "It's all on videotape," Stearns says. "He was given a warning to drop the knife, and it just happened so quickly. It's amazing how quickly it happened." The shooting was ruled unjustified, and the young cop involved left the force, though he was not prosecuted. "Seattle does have problems," Stearns says. "Anytime you've got the officers, you know, routinely — 20 percent of the time — violating our constitutional rights, that's a huge problem." That 20 percent figure comes from the Justice Department. U.S. Attorney Jenny Durkan explained that figure at a news conference in December: "We found in the cases that we reviewed that when officers used force, it was done in an unconstitutional and excessive manner nearly 20 percent of the time." Seattle officials were flabbergasted by that statistic. At the time, they asked the Justice Department to explain which use-of-force cases it was based on. Three months later, Mayor Mike McGinn is still asking. He says the federal government's response to his requests has been a simple "No." Seattle is offering to reform its police department, but it's hoping to do so on a voluntary basis. Meanwhile, the Justice Department is pressing the city to agree to court monitoring of the reform process. Like most cities in this situation, Seattle would rather avoid court supervision, which is potentially expensive and can last for years. But if that 20 percent figure is any indication, court supervision seems inevitable. Matt Hickman is a professor of criminal justice at Seattle University who used to crunch numbers at the Bureau of Justice Statistics. He calls that 20 percent figure "highly irregular," compared with other use-of-force studies. "We don't know if this is meaningful or not," Hickman says. "The unanswered questions are about how exactly they determined whether a use-of-force incident involved unconstitutional use of force, or excessive force." Hickman says definitions of excessive force vary widely, and he suspects the Justice Department's criteria were too broad to hold up under legal or scientific scrutiny. Meanwhile, U.S. Attorney Durkan says the statistics are reliable — but that's beside the point. "If you want to talk about statistics, anyone who's focused on 20 percent versus 10 percent versus 5 percent is what statisticians would call an outlier," Durkan says. "That's not the question on the table right now." Instead of "splitting hairs" over statistics, Durkan says Seattle should focus on the specific examples of appalling behavior by police. In one case, for instance, the Justice Department's report describes a shoplifter who was held by two cops as they punched her in the ribs and pepper-sprayed her in the face. "Even if you take just the examples that were illustrated in our report, people think, 'We're better than that. We shouldn't have those kinds of incidents in Seattle,' " Durkan says. Mayor McGinn agrees. He has a plan for "20 reforms in 20 months." But at City Hall, there's also a lingering sense of betrayal over how hard the Justice Department came down on Seattle, given its cooperation with the investigation. McGinn says the federal government should keep in mind that this is a city that, as he puts it, believes in "raising social justice." "Our position isn't one of stonewalling or obstructionism or 'go away' or 'we're just fine the way we are,' " he says. "I think that when you have that type of attitude from a city, you would expect that that would be taken into account." Seattle now has to decide whether to risk a lawsuit by refusing court supervision while it tries at the same time to restore faith in its police department — a faith even the mayor admits has been "shaken."